A podcast about Memphis and the creatives who live there. 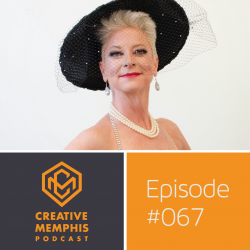 In this episode, Diane Thornton shares her process of designing from condoms, her history as a speaker, social activist, model and artist, and encourages saying the word abortion; she does this, all while living with early onset Alzheimer’s. This episode highly features the event Condomonium held by Choices. Saturday, April 15th at 7 PM – 10 PM at Playhouse on the Square.